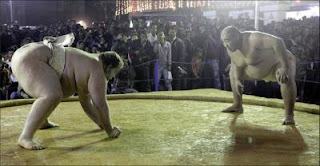 Guwahati, Feb 22 : People of Guwahati got a chance to witness five champion sumo wrestlers in action during the 19th International Guwahati Trade Fair 2012 held here recently. The organizers invited five champion sumo wrestlers at Maniram Dewan Trade Centre to popularize the sport in India, especially in the northeastern region. At the Japanese-style ring installed at the venue, the wrestlers not only took part in exhibition matches but also invited the audiences to join them. "I can see lot of potential among the youth for this sport. So I thought of promoting Sumo wrestling in the Northeast. Sumo wrestling has been seen many times during trade fairs but this is the first time we are organizing it here," said Rajesh Das, one of the organisers. Many of the visitors who came to the match had till now only heard and seen these wrestlers on television. "It's a very nice experience to see Sumo Wrestlers because I have been hearing and watching on TV this sport but I never get to see performing in front of me. So it's a great experience," said Nilakhi Kakati, a spectator. The wrestling exhibition was organized to celebrate 60 years of diplomatic relationships between India and Japan.